Alabama residents, like many others across the country, may be faced with unmanageable credit card debt and other unsecured debts. Although many consumers might be in search of a debt relief grant or some form of government assistance to resolve debts, this type of credit card assistance is not available. However, a variety of debt relief options are available to consumers struggling with out of control credit cards and other debts. In addition to personal bankruptcy, consumers can find relief in debt consolidation or debt management plans (DMPs), credit counseling, debt counseling, and even debt settlement or debt negotiation. If you are experiencing a financial hardship and in need of relief, you can request your free debt relief evaluation and savings estimate to how a debt relief program could help you. In addition to personal bankruptcy, which is considered the debt relief option of last resort - credit counseling, debt consolidation, debt management, or even debt settlement have become popular alternatives to bankruptcy. Through structured debt relief plans based upon your existing debt and available income to pay down those debts, you may find yourself breathing easier knowing that you can get expert help and get on a path to financial freedom. To explore your debt relief options, answer a few, simple questions to get your free debt relief evaluation and savings estimate at no cost to you. Begin here. 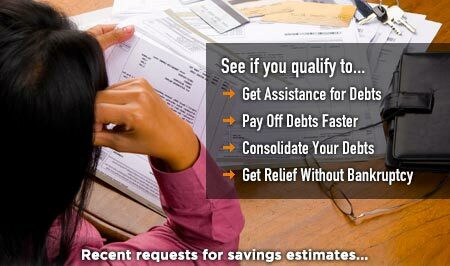 For those struggling with debts from multiple sources, like credit cards or other types of unsecured debts such as doctor or medical bills, utilities, retail store cards, gas cards, and more, debt consolidation through a debt management plan (DMP) could potentially make it much easier to pay off debts at a pace you can afford. 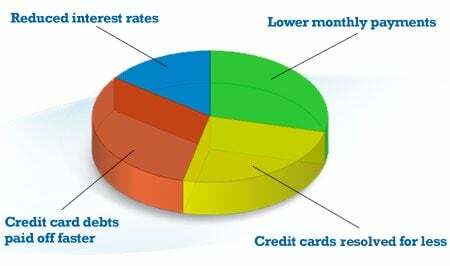 Debt consolidation, or a debt management plan, provides individuals and families struggling with multiple debts the opportunity to combine, or consolidate, high-interest credit card and unsecured debts into a single, more manageable payment plan made to a credit counseling agency. Credit counseling agencies, in turn, distribute those funds to credit card companies. When you enroll in a debt consolidation program, credit counselors typically review your finances, debt amount, and sources of income to determine how much money you can reasonably allocate each month to pay down your debts. Debt relief counselors then create a strategy to help reduce your high interest rate debts and submit proposals on your behalf to creditors requesting the benefits of debt relief. These can include reduction of interest rates, the waiving of late fees and penalties, and generally more favorable and lenient repayment plans. Creditors who understand that you are indeed experiencing a financial hardship will be more likely to agree to debt proposals and also willing to place your account into the structured debt management plan for payment over time until your debt with them is resolved. To explore your debt relief options, answer a few, simple questions and get a free debt relief evaluation and savings estimate. While the state of Alabama does not specifically offer debt grants or programs designed to help consumers with credit card debt reduction, it does provide a variety of programs for individuals and families who are low-income or need a helping hand while experiencing difficult circumstances. To help low-income individuals and families get access to basic needs and services, the state offers financial assistance and relief programs such as the Food Assistance Program (SNAP), Medicaid, and the Low-Income Home Energy Assistance Program (LIHEAP), among others. To learn more about these services, go to the state's homepage and click on the Benefits page. Another alternative to resolving credit card debts faster is debt settlement, provided that you can accumulate money in a designated "set aside" account so that you will have the funds necessary to extend a settlement offer to creditors. By seeking debt settlement, it's important to understand that if credit card companies see that you have fallen behind by 60 or 90 days or more and decide eventually to "sell off" your debt as "bad debt" to a third-party debt collector, they may only receive as little as 10 cents on the dollar. So, it stands to reason that credit card companies, in this position, may be willing to accept a reasonable settlement offer made by you or by a debt negotiation company for much less than the full amount owed. Additional factors to be aware of when considering debt settlement: When consumers default on the terms of credit card agreements in order to set aside monies in a settlement fund, creditors may threaten or take legal action. In addition, money saved through credit card settlements are subject to federal taxation. Finally, debt settlement typically will have a negative impact on personal credit, but not as severe or long lasting as a personal bankruptcy. Despite the legal and tax implications of debt settlement, it has become an increasingly popular option for consumers who would rather settle debts for as much as they can reasonably afford, rather than default on debts entirely and file for personal bankruptcy. To review your debt relief options, please take a moment to answer a few, simple questions and request your Free Debt Relief Analysis and Savings Estimate.